I am very interested in building the "3 Tube SW Battery Radio" posted on Peebles Original website. From what I can tell, the schematic calls for a midget dual 50pF variable capacitor (C8) & (C11) and 2- 2-30pF ceramic trimmers (C6) & (C10). but I was wanting to know if I could use this variable capacitor in this radio? I'm sure it will effect the number of turns in each coil. Also, I want to add a BCB coil to receive broadcast stations as well. One likely problem example: as your 365pF VC is tuned beyond its 50pF point, towards maximum capacitance, the regenerative detective may no longer oscillate. To correct this, you'll have to make circuit changes, eg, increase the number of turns on the tickler coil L8. But this change will likely adversely affect regeneration and oscillation control at the high end of the tuning range. You'll also probably have to change the values of R4 (the regeneration control, 50K) and R5, the 30K voltage dropping resistor. This is not to say it can't be done. But you have to expect to do some experimenting and adjusting. Just takes a bit of time and patience. I'd build a prototype version, using the parts you have on hand, winding the coils as specified. When you run into problems, ask for help here. When you get all the kinks worked out, then you can build a proper finished version. Since the frame of the variable cap is at ground, you can place a capacitor in series with the ungrounded ends. A 56pF cap will give a max capacitance of about 48.6pF or a 62pF will yield about 53pF. A typical 365pF cap for broadcast frequencies will have a minimum capacitance somewhere around 40 pF so the minimum capacitance values will be 23pF with the 56pF series cap and 24pF with the 62pF cap. 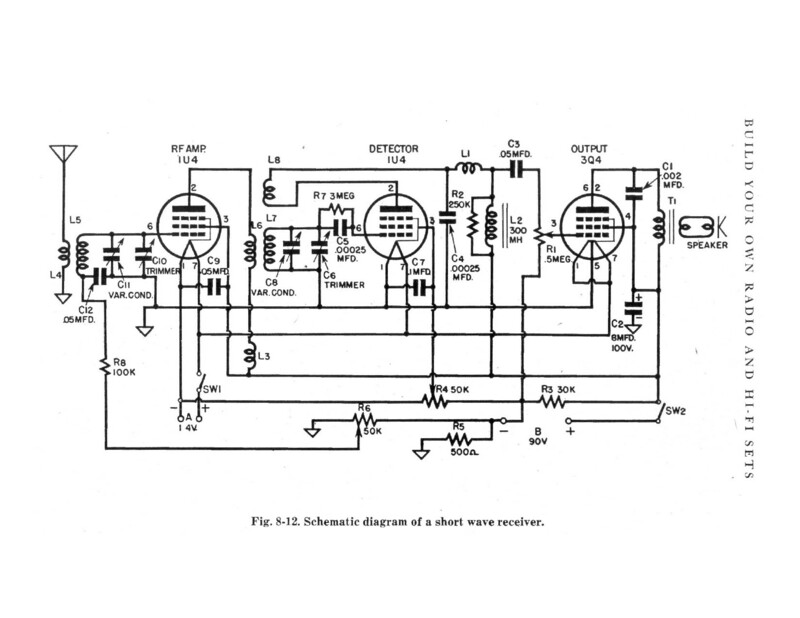 The one advantage to this scheme is a coil wound for broadcast use could have an extra pin that shorts out the series cap to get the proper capacitance range for those frequencies. IMHO get the correct variable capacitor, then circuit compensations will not be required. Radio satisfaction will be guaranteed. If you didn't mind giving up the BC band, you could always remove some of the plates from the rotor of each section of your 365pF cap. Count the number of plates in one of the rotors. Call this n1. Then the number of plates to remove from each section is the number closest to 63/73 times n1. Kirk, I read the 10 pdf from the Peebles site. This receiver was meant for the 80, 40, 20, and 10 meter ham bands. Is that limited coverage what you want? You can build it as a general coverage receiver by using your 365pF VC for Main Tuning or Bandset, and an additional 5-15pF VC as bandspread. Both VCs will probably need reduction drives. There is no mention in the building instructions about shielding the RF amp from the detector. Shielding is especially important when using a ganged VC: the signal from the antenna can easily be coupled around the RF amp through the two ganged sections, and that will defeat the purpose of the RF amp, and may cause other problems. 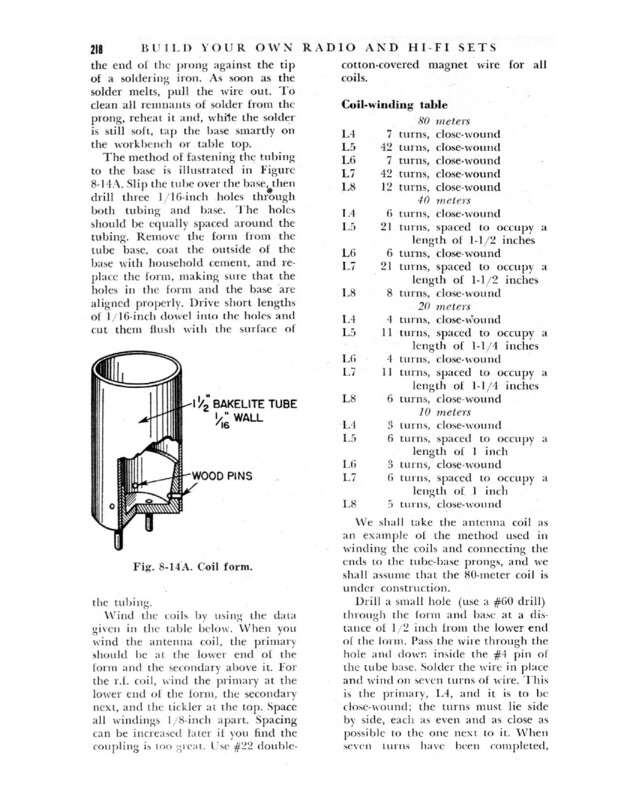 Old ARRL handbooks (from the 1930s) have explanations and instructions on RF shielding for receivers. You can use many of the same parts for both receivers. Notice how the RF amp and detector are separated and shielded from each other. The Peebles two tube regen kit does shortwave and BCB. You could always add the 3rd tube and the speaker to the circuit.